More laissez-faire readers are likely to be pretty excited skimming the headlines and learning that the 75% tax on the wealthiest Frenchmen has been struck down by the Constitutional Committee. 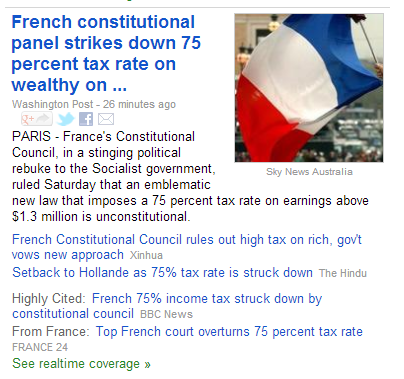 Having read this myself, I paused: "how does a constitution possibly bar some arbitrarily high tax rate?" The only reasonable possibility of this in my mind would be if the Committee made a pretty long stretch of one's liberty from unreasonable seizure. Reading more deeply revealed that the Committee repealed the law due to what are ultimately minor structural details (targeting individuals rather than households, primarily), and Hollande has already declared that a re-structured law will come right back in 2013 with full force. The first observation here is that the headlines of some very reputable news organizations are simply deceptive in their oversimplification--the casual reader would clearly interpret the headlines below to say that the law is dead. It's very much not--it's in fact going to be quite fine. 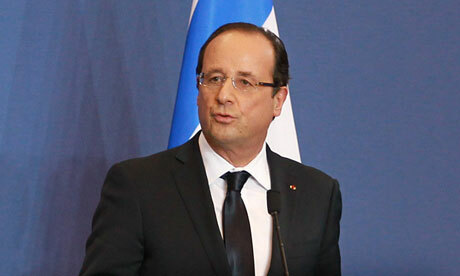 What this means for France is that its flow of super-rich citizens to London and Bern won't end any time soon. French national debt is nearing 90% of its GDP (which compares to a staggering 110% for the US) and climbing quickly--obviously losing this income stream will hurt, though France is likely to generate more income from increases on those who stay than it loses by those who leave. Geopolitically this tax wash may not be massively significant, but French unemployment is at 10.7% and--unlike the US, UK, or Germany--has been climbing for 19 months in a row. France's biggest risk is that it loses those well-suited to launch or fund new companies or projects that will push its economy forward and hire its labor force. French labor & consumer laws aren't exactly business-friendly, but the fact that starting companies is difficult in France makes it even more critical to have individuals that can muster lots of money/resources at once. And, just for chuckles, Monty Python brings us a timely analogy for the tax law. 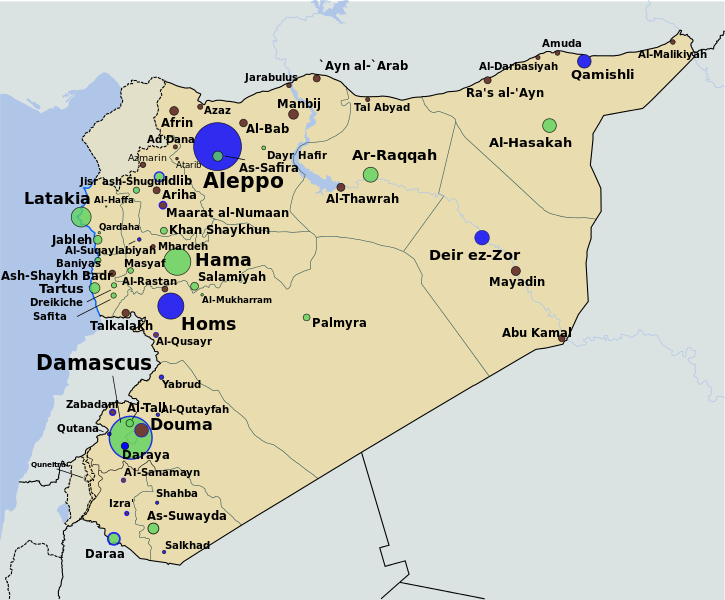 Desert/East: Majority towns under rebel control with the largest towns still under regime control, but with limited interest on either side to mount an offensive. Note on the map that many small towns off the coast are in rebel control or are contested--Rebels enjoy much of their support from the countryside. Northern Border: Firmly under rebel and Kurdish control. The rebels use this open operating area to get access to Turkey for supply support, medical treatment, and to create a safe haven for opposition command, likely operating with NATO intelligence support. It is unlikely to fall to the Syrian military any time soon and will keep the battle for Aleppo fierce as long as it remains open. The Kurds are participating in the battle of Aleppo, but are hedging their bets to some extent by spending energy entrenching their positions in northern Syria. In any stalemate outcome, Kurds will likely be able to begin partially autonomous administration of this area with support from Iraqi Kurdistan. 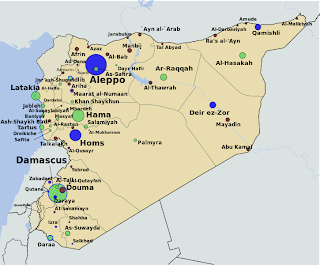 Interestingly, a decisive rebel win may cause the most reprisal here for earlier Kurdish support of Assad. Damascus: Firmly held in the center by the government, but the biggest suburbs are under rebel control, with all surrounding suburbs held by rebels. This has held for the past half-year and is unlikely to change too soon. Homs: 70% under regime control, with battle lines fairly solid. While Homs used to be the center of anti-regime protests, it is now quiet. Don't expect much movement here. Hama: Firmly under regime control. Coast: While a few small towns west of Hama are under rebel control, they're not enough of a priority for the regime to be dealt with yet. Most cosmopolitan towns along the coast here are surprisingly peaceful and functional as the war rages on elsewhere. Rebels simply lack the support or geogrpahical presence to make an impact here. Aleppo: Aleppo is probably the big prize on the table--if one side can take it decisively, it may mark a turning point in the war. The mega-city is the cultural and economic capital of Syria (think New York City), and the most intensely contested for the past 6 months. Below you'll see the current battle lines of the city (yellow is Kurdish, green is rebel, red is regime), though they shift frequently. 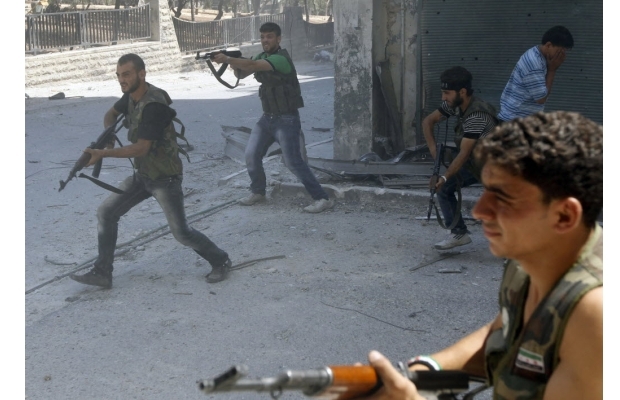 Rebels have been driven out of significant swaths of the city that they've taken before. 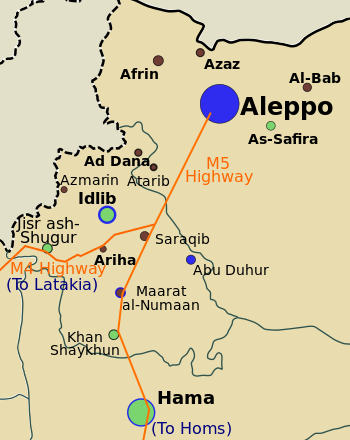 Note that army bases ar in the center and west, and serve as local zones of operation for the regime. Rebels have not made significant forward progress since September, but they do have the city "largely" surrounded, according to Stratfor. In particular, the rebels have launched offensives as less-defended towns and bases south and west of Aleppo, targeting its supply lines. These attacks appear to be close to capturing--or at least cutting off--the M4 and M5 highways, which would leave Aleppo completely cut off from regime supply lines (where the Rebels continue to enjoy fresh supplies from Turkey). If the rebels succeed in this offensive, I believe they should be able to slowly (although the final collapse of regime forces would be sudden) take Aleppo. That said, to "take" Aleppo is a tenuous term, at best. Many citizens of Aleppo are strong regime supporters, and most others simply want to stay out of the fight. Furthermore, the regime will likely continue to bomb Aleppo and ensure that the rebels cannot "get their feet under them" in the city. 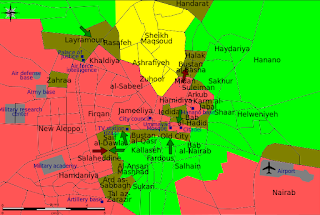 Likely, the best the Rebels will be able to do would be to cause a mass surrender/defeat of regime forces after a fairly long siege (in which the city remains surrounded and cut off), and then push the line forward of the city without really holding onto it too tightly. That said, this is a win that should not be under-stated. 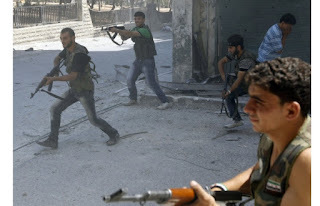 Overall: The rebels will struggle to build any governance in major cities (Homs, Hama, Aleppo, Damascus) that they hold. The regime has shown a willingness to use heavy shelling, aerial bombardment, and even recently SCUD missiles to drive rebels out of neighborhoods they own. Unfortunately for the rebels, many locals are just as upset with the rebels as the regime for bringing the fight to their neighborhood. This war will be slow, but I believe it is starting to look a bit like the Chinese civil war of 1945-1949. Nationalist forces moved increasingly to entrenching themselves in cities, where Communist forces were able to move fairly feely among the countryside, increase their capability, and amass forces for offensives in increasingly large towns, acquiring arms, tanks, and defectors along the way. The rebels of Syria have used similar tactics, buliding safe operating havens in the north and east, and using hit-and-run tactics on major sites--including large air force and army bases--to eliminate the regime's presence near Aleppo without giving the regime targets to hit with aerial bombardment. The regime risks a slow collapse similar to that of the Chinese Nationalist government if it is not able to go back on the offensive to break rebel logistics capability and keep them "scattered." The advantage is to the rebels but there is no quick win in sight. Many Syrians remain on the sidelines in this fight--ultimately, despite many having strong opinions on the matter, most simply want to be left in peace and enjoy life. And while the regime is certainly guilty of indiscriminate bombing, torture, and many other atrocities, the rebels are not without blood on their hands. For this reason, the rebels are struggling to win the massive popular support that has been seen in many other Arab Spring uprisings. Defections continue slowly, but they will end. Ultimately there is a large Alawite minority that is (rightly so) terrified that their fall will mean massive retributions. A good example of this was the retributions against the Sunni Arabs in Iraq that were quite painful and led to the Sunni insurgency, which lasted for years. Many of these folks know that very bad consequences await them if they were to lose outright, and nobody can provide a golden parachute for all of them. The Syrian opposition recently unified--at least on paper--under the Syrian National Coalition, which enjoys the recognition as "the legitimate representative of the Syrian people" from over 100 countries, including most of the Arab League, Turkey, the US, UK, France, Germany, and much of the rest of the EU. This will open up more overt opportunities to fund, supply, and otherwise support the rebels, even if full military intervention remains unlikely. What's not clear is how widely it is supported at home. In bad news, extremists continue to gain sway in Syria, with at least 30,000 Islamist Mujadeen among the rebel fighters, and many Syrians fear the rebels are picking up increasingly extremist rhetoric. A similar risk came true in a much shorter war in Libya, in which terrorists attacked the Benghazi consulate and killed the American ambassador. As the war drags out, this extremist cell is likely to grow, and one of the first missions of whoever wins will be to stamp it out.